Adolf Hitler always believed he was doomed to suffer an early death from some kind of major illness, just like his parents. His father had collapsed suddenly one day from a lung hemorrhage when Hitler was a boy. His mother later perished in long agony from cancer during his teenage years. Convinced that he would not live to be an old man, Hitler wanted his to wage his war for Lebensraum sooner rather than later, while he was still relatively young and vigorous. "I would rather have the war when I'm 50 than when I'm 55 or 60," he would say repeatedly. And time was now catching up with him. He would be fifty within a year. Although he had just taken Austria without firing a shot, he decided he wanted to "smash" Czechoslovakia next door by military force. Thus he assembled his top generals and ordered them to prepare for an attack on the small democratic republic by October 1st, 1938. But his order appalled the General Staff. They knew that an attack on Czechoslovakia might erupt into a war against Britain and France, and possibly even with Soviet Russia. The German Army at this time was not ready for such a war. It only had 31 fully armed divisions along with 7 reserve divisions. The French alone had over 100 divisions while the Czechs had 45 and a heavily fortified defense line along the Czech-German border. 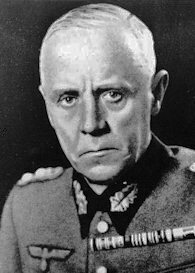 To summarize all of the problems, General Ludwig Beck, Chief of the General Staff, wrote a detailed analysis of the pending military disaster if Germany attacked Czechoslovakia. Beck gave his report to General Walther von Brauchitsch, Commander-in-Chief of the Army, urging Brauchitsch to convene a secret conference of top generals to discuss the matter. On August 4th, 1938, a secret Army meeting was indeed held. Beck read his lengthy report to the assembled officers. They all agreed something had to be done to prevent certain ruin. Beck hoped they would all resign together right then and there. But no one resigned except Beck, a few days later, out of disgust with the whole situation. 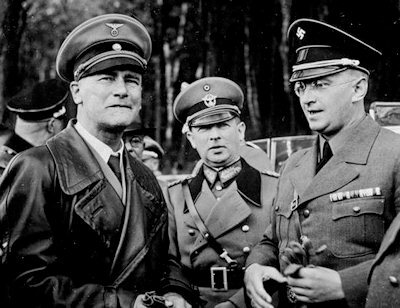 Generals Ludwig Beck (left) and Franz Halder - the men who might have toppled Hitler in 1938 and prevented World War II. Below: Konrad Henlein (right) seen with high ranking Nazi Dr. Wilhelm Frick upon his visit to the Sudetenland in September 1938..
Hitler immediately replaced him with General Franz Halder and made sure no news leaked out about Beck's sudden resignation. 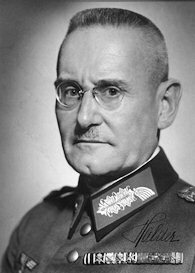 Unknown to Hitler, General Halder sympathized with Beck as to the utter folly of Hitler's plan to attack Czechoslovakia. In the days that followed, Beck and Halder formed a group of conspirators consisting of several top generals, along with former diplomat Ulrich von Hassell, Admiral Wilhelm Canaris who was Chief of German Intelligence, and Berlin's Police Chief, Graf von Helldorf. They hatched a plot to arrest Hitler the very moment he gave the actual invasion order. According to their plan, Berlin would be sealed off by special Army units to prevent the SS from interfering. Other units, aided by anti-Nazis in the Berlin Police, would seize important government buildings while top Nazis such as Göring, Goebbels and Himmler would be arrested. Assuming this all worked, Hitler would be hauled before a special court and charged with leading Germany toward a military disaster. But there was one big if in this whole scenario. The plan would only work if both Britain and France maintained a belligerent attitude toward Hitler and made it known to the world that they would fight to preserve the little Czech Republic. This would serve to convince the German people that certain defeat awaited Germany if it attacked Czechoslovakia and would justify the overthrow of Hitler. 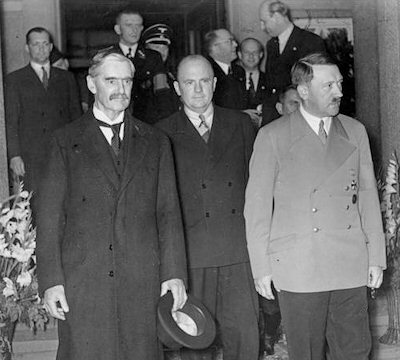 To insure that Britain and France understood how high the stakes were, the conspirators sent agents to England to secretly inform Prime Minister Neville Chamberlain that Hitler was planning to attack Czechoslovakia. They also informed the British of their intentions to overthrow Hitler and requested that both Britain and France adopt an openly aggressive stance toward Hitler. However, major problems prevented this from happening. First, the messengers were not taken seriously by the British who found themselves unable to trust the same German Army which had been steadfastly aiding Hitler since his takeover of power in 1933. Secondly, Prime Minister Chamberlain had his own peace agenda in mind and was willing to negotiate to the hilt to prevent another European war. The First World War had ended not even twenty years ago and had wiped out an entire generation of young men in England, France and Germany. No one in his right mind wanted to risk that sort of war in Europe again – except Hitler. After World War I, the democratic Republic of Czechoslovakia had been created by the victorious Western Allies out of the remnants of the old Hapsburg Empire. But Czechoslovakia was hampered from day one by serious conflict among its diverse ethnic groups including the Czechs, Slovaks, Hungarians and over three million ethnic Germans. The ethnic Germans lived in the western part of the country known as the Sudetenland, an area now surrounded on three sides by Hitler's Army. The area had a powerful pro-Nazi organization called the Sudeten German Party led by a gymnastics teacher named Konrad Henlein. It was funded by and took its orders directly from Berlin. Most of the Germans in the Sudetenland were members. Like the Austrian Germans, they longed to attach themselves to the rising star of Hitler's Germany. On March 28, 1938, shortly after the Austrian Anschluss, Henlein traveled to Berlin and was told by Hitler to cause trouble in Czechoslovakia by making ever-increasing demands on behalf of the Sudeten German Party "which are unacceptable to the Czech government." The strategy worked well. Every time the Czech government was about to give in, Henlein demanded something more so that no agreement could ever be reached. Throughout the summer of 1938, Nazi agitators in the Sudetenland caused political and social unrest while Goebbels' propaganda machine waged a ferocious anti-Czech campaign claiming that Sudeten Germans were being persecuted by the Czechs. At the annual Nuremberg Rally in early September, Hitler and Göring both made threatening speeches concerning the so-called Sudeten Question. 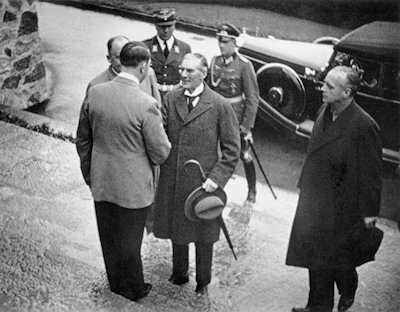 Hitler first welcomes British Prime Minister Neville Chamberlain at Berchtesgaden on a rainy Thursday, September 15th, 1938. On the right is Nazi Foreign Minister Ribbentrop. Below: Chamberlain grimly departs after their second meeting at Bad Godesberg at which Hitler had raised the stakes considerably - accompanied by the Führer and Hitler's interpreter Dr. Schmidt. 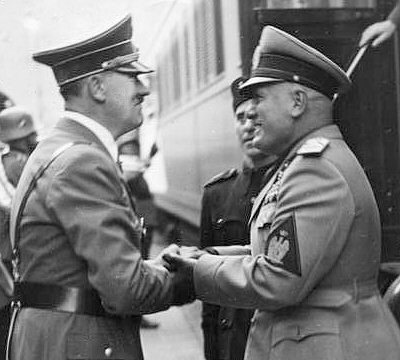 Below: Benito Mussolini is warmly greeted by Hitler as his train arrives at Munich for the 3rd and final meeting. 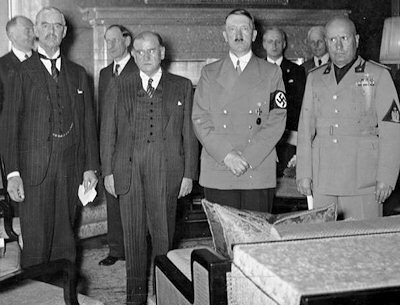 Below: Britain, France, Germany and Italy at the Munich meeting - represented by Chamberlain, Daladier, Hitler and Mussolini. 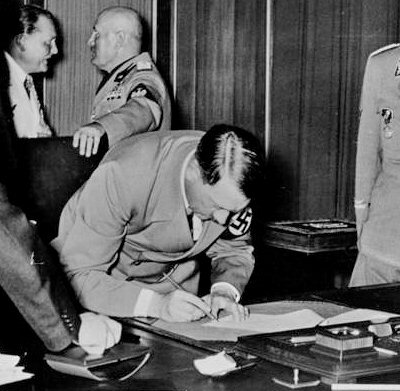 Below: Hitler signs the Munich Agreement on September 30th. Behind him Mussolini is seen chatting with Hermann Göring. With Germany edging ever-closer to war, the peace-minded British Prime Minister decided to send a personal telegram to Hitler asking for a face-to-face meeting "to find a peaceful solution." Hitler was genuinely surprised by the request and immediately agreed to a meeting. Thus, on the morning of September 15, 1938, the 69-year-old Neville Chamberlain boarded an airplane for the first time in his life and departed England. Seven hours later he arrived by car at Berchtesgaden and met Hitler for the first time. The Führer led him into his villa and up to the great room with the big picture window and views of the Alps. Six months earlier, the Chancellor of Austria had walked into this same room hoping to negotiate a peaceful solution and had been relentlessly badgered. This time, Hitler once again dominated the whole discussion, but carefully avoided the crude bullying tactics he had used before. Chamberlain was, after all, the head of government for the British Empire, one of the greatest powers the world had ever known. To the British Prime Minister, Hitler complained at length about the "persecuted" Sudeten Germans inside Czechoslovakia and then boldly asked if the Sudetenland area could be simply handed over to Germany. Chamberlain responded that he would consider asking the Czechs to cede the Sudetenland but said he was not prepared give an answer on the spot and first needed to consult with his Cabinet back in London. He asked Hitler to refrain from any military action until he returned for his next visit. Hitler agreed to the military delay. Chamberlain returned to London and succeeded in getting his government's approval for the Sudetenland concession. He also received a favorable response from Britain's former World War I ally, France. Regarding his first impression of Hitler, Chamberlain commented: "In spite of the hardness and ruthlessness I thought I saw in his face, I got the impression that here was a man who could be relied upon when he had given his word." Meanwhile, behind his back, Hitler proceeded ahead with his war plans. Representatives from Poland and Hungary were secretly approached by the Nazis and asked if they each wanted a piece of Czechoslovakia in return for letting Hitler break up the country. The military rulers of Poland, along with Hungary's Fascist government, both agreed to stand by and let Hitler invade Czechoslovakia in return for a share of the spoils. Britain and France, having agreed among themselves to give Hitler the Sudetenland, now confronted the Czech government. On September 19th, the British and French ambassadors in Prague sternly advised the Czechs that they should give up all areas along the German border where 50 percent of the population or more was German. The Czech government, realizing it had been abandoned by its Western Allies, reluctantly gave in and agreed to the terms. On September 22nd, an optimistic Chamberlain returned to Germany to see Hitler, this time to a hotel at Godesberg along the Rhine River. The Prime Minister informed Hitler that he could have the Sudetenland after all, just as he wanted. "Do I understand that the British, French, and Czech governments have agreed to the transfer of the Sudetenland from Czechoslovakia to Germany?" Hitler asked him. "Yes," said the smiling Chamberlain. "I'm awfully sorry," Hitler responded, "but that won't do anymore...this solution is no longer of any use." Chamberlain was stunned, his hopes for an easy peace suddenly dashed. Hitler now raised the stakes by demanding a German Army occupation of the Sudetenland by October 1st and the expulsion of all non-Germans living there. Chamberlain, utterly flabbergasted at this dangerous turn of events, informed Hitler this amounted to a military ultimatum and said the Czechs wouldn't agree to such terms. But Hitler said he didn't care. The Czechs had to agree to an Army occupation, or else. The British Prime Minister had just become the second victim of Hitler's gangster diplomacy. He had risked his whole political career and the prestige of the British Empire to appease Hitler, only to be rudely turned down for no apparent reason. Chamberlain returned home deeply disappointed to ponder what to do about this mess. France, on hearing of the Führer's ultimatum, mobilized a hundred Army divisions and began packing them off toward the French-German border. The Czech Army consisting of a million men was mobilized. Britain also put its entire naval fleet on alert and declared a state of emergency in London. Europe, it seemed, was headed for war after all. This was good news for the anti-Hitler conspirators in Germany. Things were now going as they had hoped, and they prepared to strike against Hitler in Berlin as soon as he gave the order to invade Czechoslovakia. Interestingly, Hitler attempted to arouse popular support for the coming war by having an Army division parade through the streets of Berlin. But all along the parade route people turned away or ducked into nearby stores and subway entrances. The Führer stood on the balcony of the Reich Chancellery reviewing the troops. But after seeing that only a few hundred people cared to watch, Hitler went back inside. Some two decades earlier, at the beginning of World War I, throngs of people had filled Berlin's streets to cheer their young soldiers and toss flowers as they marched off to the Front. Now, nobody cheered. The German people clearly did not want another war, and Hitler saw this. As a result, he decided to step back from the brink and delay his war for Lebensraum for a while. He sent a letter to Chamberlain promising that if the Western Allies yielded the Sudetenland to the German Army, it would not result in the destruction of Czechoslovakia. Germany would even be glad to join with Britain and France in guaranteeing the rest of Czechoslovakia from any further aggression. Chamberlain decided to grasp at this last chance for saving the peace. He telegraphed Hitler that he was ready to return for more talks "at once." He also sent a telegram to Italy's Fascist leader, Benito Mussolini, asking him to intercede with Hitler on his behalf. Mussolini then contacted Hitler and proposed a joint summit that would include Germany, Britain, France, and Italy. Hitler agreed to it. The location chosen was Munich. Before leaving England for his third and final trip to Germany, Chamberlain declared: "When I was a little boy, I used to repeat, 'If at first you don't succeed, try, try, try again.' That's what I am doing. When I come back I hope I may be able to say, as Hotspur says in Henry IV, 'Out of this nettle, danger, we plucked this flower, safely.' "
The Munich conference took place inside a brand new Nazi building called the Führerbau on September 29th and lasted into the early morning hours of the 30th. It was attended by Hitler, Chamberlain, Mussolini, and French Prime Minister, Edouard Daladier. Czech representatives were also there but had to wait outside the meeting room because Hitler refused to let them inside to participate. At the conference, Mussolini said he had his own proposal which might help to resolve things quickly. Unknown to Chamberlain and Daladier, that proposal had been supplied to Mussolini by the Nazis and essentially contained the same demands as Hitler's ultimatum. However, Chamberlain and Daladier accepted this proposal without hesitation in their overwhelming desire to avoid bloodshed. 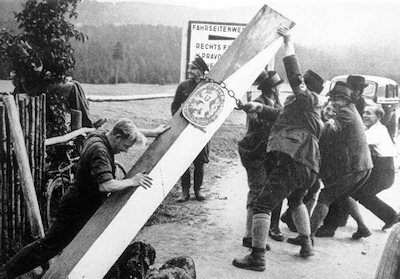 Upon the announcement of the Munich Agreement, Nazi supporters in the Sudetenland rip down border posts separating them from Germany. 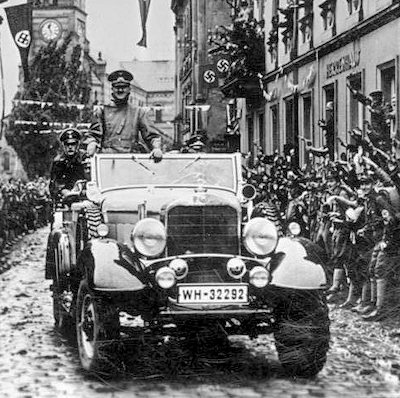 Below: Amid much fanfare, a delighted Führer passes through the town of Graslitz in the Sudetenland on October 4th. Just after 1 a.m. on September 30th, the four leaders signed the Munich Agreement allowing the German Army to occupy the Sudetenland beginning on October 1st, to be completed by October 10th. About 1:30 a.m., the Czech representatives were informed of the terms by Chamberlain and Daladier. They had no say in the matter and had no choice but to comply. Upon arriving back home in London, Chamberlain declared: "The settlement of the Czechoslovakian problem which has now been achieved is in my view only the prelude to a larger settlement in which all Europe may find peace." Few politicians in Britain disagreed. Winston Churchill voiced the loudest single protest, calling the Munich Agreement "a total, unmitigated defeat." Back in Germany, the Army generals who had been preparing to oust Hitler gave up in complete dismay. All plans concerning the overthrow of the Führer were shelved. The generals now resigned themselves to follow Hitler into the abyss that lay ahead for Germany. On Saturday, October 1st, the German Army rolled into the Sudetenland on schedule. Many of the Czechs living there fled their homes in panic with only the clothes on their back. Once again Hitler had gotten everything he wanted without firing a single shot. Incredibly, this time he would have welcomed a fight. Somewhat exasperated, he said: "I did not think it possible that Czechoslovakia would be virtually served up to me on a plate by her friends." Regarding his impression of the Western Allies, Hitler would later say: "Our enemies are little worms. I saw them at Munich." Regarding his final impression of Hitler, Chamberlain said: "Hitler is the commonest little swine I have ever encountered." But by now, success after success had made Hitler and the Nazis drunk with power. They were beginning to think they could do anything, even conquer the world. Hitler's primary goal of Lebensraum was being achieved step by step, just as he had planned. Now it was time to pay some attention to his secondary goal, a reckoning with the Jews. Up till now, the Nazis had largely held off out of concern for international opinion. But that didn't seem to matter so much anymore. And so, in November 1938, five years of pent-up hate were let loose in an event which stunned the world and marked the beginning of what became known as the Holocaust – the Night of Broken Glass.